Advertisers want to protect their brands from damage that comes from association with illegal activity. Online advertisers face risks from sites that infringe on the rights of others by facilitating the distribution of pirated content and counterfeit products. Consumers may mistakenly believe that the sites’ offerings are authorized by well-known brands. Such misplaced advertising also harms content creators and legitimate content distributors by providing economic resources that fuel these illegal enterprises and putting enormous profits into their coffers. Many of these sites also use fraud or deceptive practices to avoid the standards set by the advertiser or its agency, driving revenue to those who steal copyrighted content or otherwise violate others’ trademarks. TAG launched its Certified Against Piracy Program in 2015 to help advertisers and ad agencies avoid damage to their brands from ad placement on websites and other media properties that facilitate the distribution of pirated content and counterfeit products. Research commissioned by TAG and undertaken by Ernst & Young LLP in 2017 showed the impact of industry efforts to reduce ad-supported content piracy. The study found that anti- piracy steps taken by the digital advertising industry have reduced ad revenue for pirate sites by between 48 and 61 percent, notable progress against the $2.4 billion problem of infringing content measured by Ernst & Young in 2015. 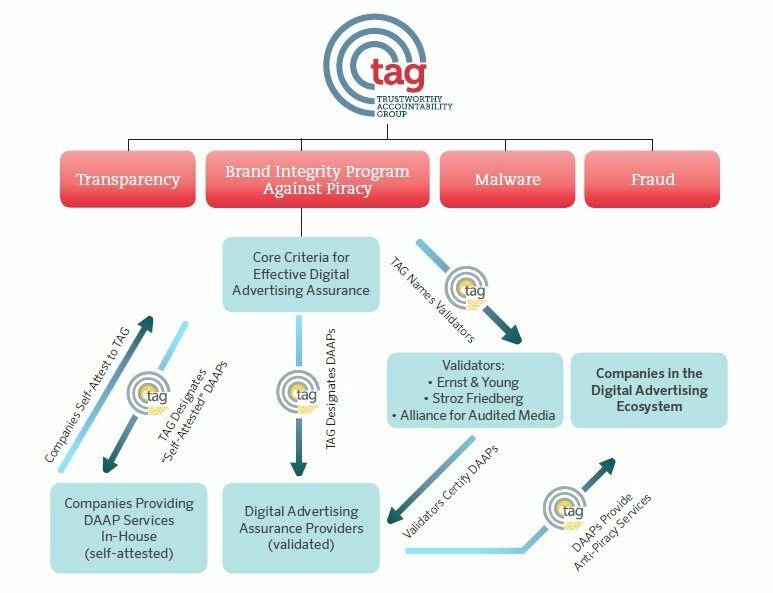 TAG’s Anti-Piracy Working Group created and maintains the Certified Against Piracy Program to help advertisers and ad agencies avoid damage to their brands from ad placement on websites and other media properties that facilitate the distribution of pirated content and counterfeit products.